Chicago Bulls NBA World Championship Ring. Chicago Bulls are an American professional basketball team. They play in Chicago, Illinois at the United Center. The Bulls are a part of the National Basketball Association (NBA). They were named the Bulls in reference to the Chicago Union Stockyards, which was once a major business in Chicago. The current head coach is Fred Hoiberg. 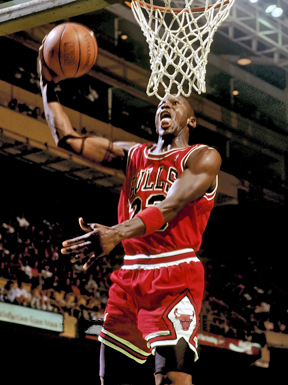 Michael Jordan was drafted third overall by the Bulls in 1984. He won six championships and six Finals MVPs for Chicago. Michael Jordan played for the Chicago Bulls from 1984 until 1993 and from 1995 until 1998, leading the team to six NBA championships. In the 21st Century, Derrick Rose was the star of the Bulls until his injuries prevented him to play. The Bulls won 72 games during the 1995–96 NBA season, setting an NBA record that stood until the Golden State Warriors won 73 games during the 2015–16 NBA season. 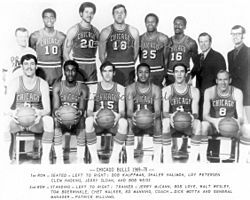 The Bulls were the first team in NBA history to win 70 games or more in a single season, and the only NBA franchise to do so until the 2015–16 Warriors. Many experts and analysts consider the 1996 Bulls to be one of the greatest teams in NBA history. The iconic Bulls' logo is a charging red bull's face. The logo was designed by noted American graphic designer Dean P. Wessel and was adopted in 1966. At one point, the Bulls also had an alternate logo during the early 1970s, featuring the same Bulls logo, but with a cloud that says "Windy City" below the bull's nose. The Bulls have three different uniforms: a white home uniform, a red road uniform, and a black alternate road uniform. The design of the white and red sets are nearly identical, with the team name featured on the front over the number, and the player's last name over the number on the back and under the Bulls' logo. The shorts have the Bulls logo in a diamond shaped design on the sides of the legs. The red and white uniforms have remained mostly unchanged since 1966, with minor modifications from off-centered numbers, drop shadows and side stripes to white lettering and "Chicago" wordmark on the road uniforms. The present red/white uniform design was unveiled in the 1985–86 season, first using screen printing (with the player names in block lettering without the additional trim), before returning to the traditional sewing methods (player names are in serifed block lettering and with added trim). The Bulls logo was added atop the player's name in 2004. Since the 2014–15 season, a gold tab representing the Bulls' six championships was added on the back hemline, while the NBA logo replaced the Bulls logo atop the player's name. Benny the Bull at the United Center. Benny the Bull is the main mascot of the Chicago Bulls. 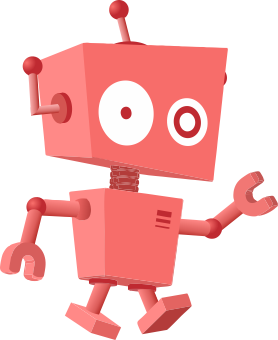 He was first introduced in 1969. Benny is a red bull who wears number 1. Benny is one of the oldest and best known mascots in all of professional sports. The Bulls also had another mascot named Da Bull. Introduced in 1995, he was described on the team website as being the high flying cousin of Benny, known for his dunking skills. Bulls head coach Phil Jackson consulting Michael Jordan in 1997. Luol Deng made his first All-Star appearance with the team in 2012 and his second in 2013. Joakim Noah was drafted by the Bulls in 2007. He was named an All Star for the first time in 2013 and for the second time in 2014. Derrick Rose was drafted first overall by the Bulls in 2008. He was the 2010–2011 regular season MVP. Tom Thibodeau coached the Bulls to 62 wins in his first season. Fred Hoiberg is the 19th head coach in the franchise's history. Chicago Bulls Facts for Kids. Kiddle Encyclopedia.